The press conference was opened by Peter Edinger, ATI's Vide President in Europe. Before disclosing the future plans Peter touched upon the summits reached. ATI's most significant achievement in the 3D sphere was Radeon 9700 which got the title of the fastest graphics chip of that time. 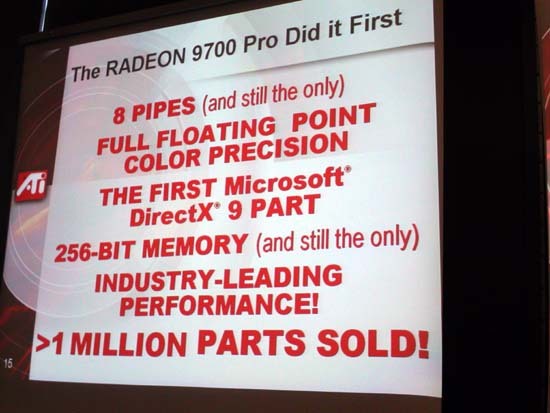 Radeon 9700 Pro got a lot of new features, and the bright slide "Radeon 9700 Pro Did It First" emphasized significance of its advent. 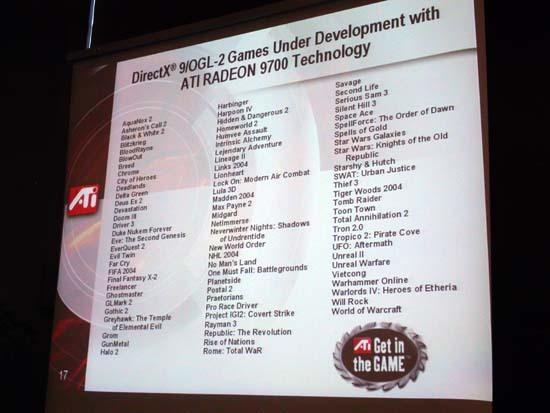 After that they demonstrated an impressive list of games supporting or going to support all the might of Radeon 9700 Pro due to DirectX 9 or OGL-2. Beside the technical achievements ATI also spoke about its marketing success. According to the company, in 2003 the demand for their products will be stably growing in Europe. The slide below looks a bit too optimistic but I couldn't help showing it to you. Such success was achieved primarily thanks to its partners: Gigabyte, FIC, Sapphire, Hercules, Connect3D.com, Yuan, HIS, CP Technology and Wistron. NVIDIA's list can be much lengthier, but it's possible that exactly these companies will help ATI climb higher summits of the graphics-card world. ATI says that in comparison with 2001 the company itself produces fewer finished boards than its partners. Like NVIDIA, it produces mostly components. One of the key concepts at CeBIT 2003 was Intel Centrino, and at the press conference held in Hannover during CeBIT 2003 ATI demonstrated two graphics chips for portable PCs: MOBILITY RADEON 9600 and MOBILITY RADEON 7000. 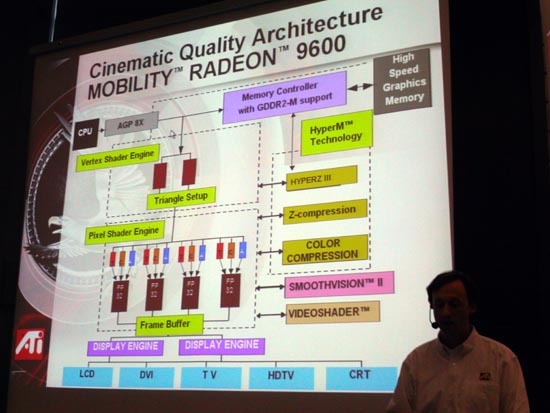 MOBILITY RADEON 9600 supports Microsoft DirectX 9.0, programmable Pixel Shader 2.0, GDDR2-M memory (up to 128 MB). The chip is based on the 0.13 micron technological process at TSMC's plants, 1.0 V supply voltage, 0.5 W power consumption in the standby mode. MOBILITY RADEON 7000 IGP chip is used for developing integrated solutions; it supports DDR333 and optimized operation under Intel Pentium-M equipped with FSB 400 MHz, Intel Pentium 4-M with FSB 533 MHz and even Intel Pentium 4 for desktop PCs. The new chipset of RADEON IGP family features a 64-bit architecture, an integrated graphics core supporting POWERPLAY technology and AGP 4X bus. Also, it sports Fast Z-Clear 3D rendering technology, iDCT technology for DVD quality optimization, two CRT or DVI-I outputs, TV-out etc. The chipset is in a 596-pin BGA package, 35 x 35 mm, and back compatible with RADEON IGP 340M chipset. Besides, there will be a compact version in the 718-pin BGA case, 31 x 31mm. The company has already published a list of SO-DIMM memory modules compatible with the new chipset; it covers solutions from such companies as Infineon, Samsung, Nanya and Micron. 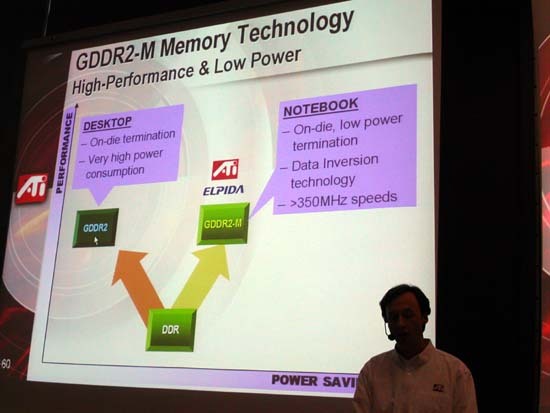 ATI states that DDR333 memory boosts performance by 25% as compared to DDR266 used in IGP 340M. Mobility Radeon 9200 was already reviewed at our site. At the press conference the company stressed that this chip was positioned as a mainstream solution. 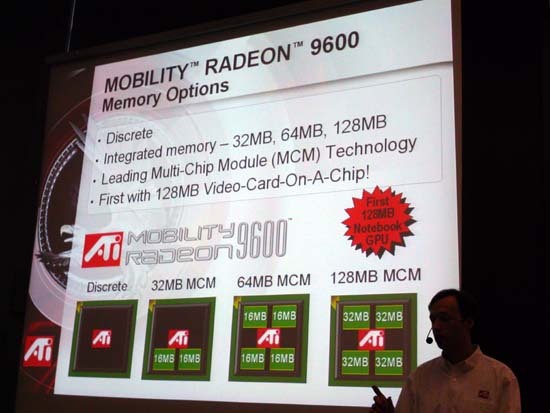 Mobility Radeon 9200 is almost the same as Radeon 9000: the same chip/memory clock speeds - 250/200 MHz, 128 MB 128bit memory. 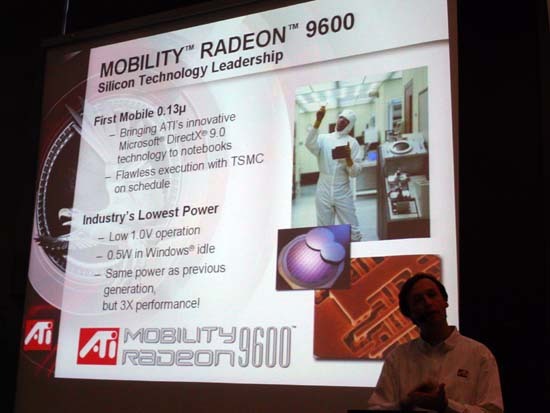 However, Mobility Radeon 9200 supports AGP 8x (the main difference) and ATI's proprietary technology PowerPlay developed to increase run-down time of a mobile computer at the expense of more rational power consumption and redistribution of energy resources. Mobility Radeon 9200 gets a considerable performance gain in applications which actively use 3D subsystems, in comparison with Mobility Radeon 7500. 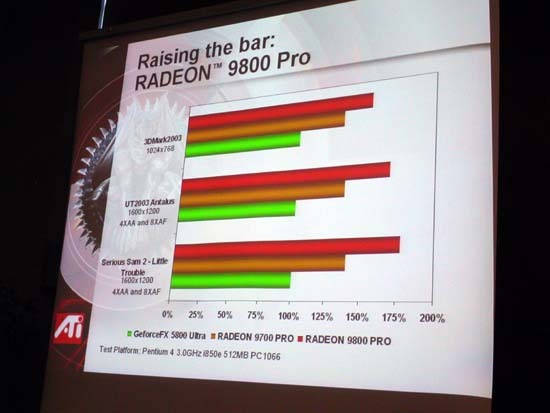 A relatively new model of Radeon 9800 Pro is offered as the most efficient solution. Below you can see that GeForceFX 5800 Ultra yields both to Radeon 9800 Pro and even to the slower Radeon 9700 Pro. I'm sure NVIDIA has similar diagrams with a little bit different results, that is why I'll leave this slide comments. To prove trustworthiness of the diagrams ATI ran several demos where Radeon 9800 Pro outscored one of NVIDIA's most efficient chips GeForceFX 5800 Ultra in several parameters. I hope that in the sphere of PC mobile solutions and high-performance 3D graphics ATI will keep on moving ahead in great strides, and its announcements will become true.